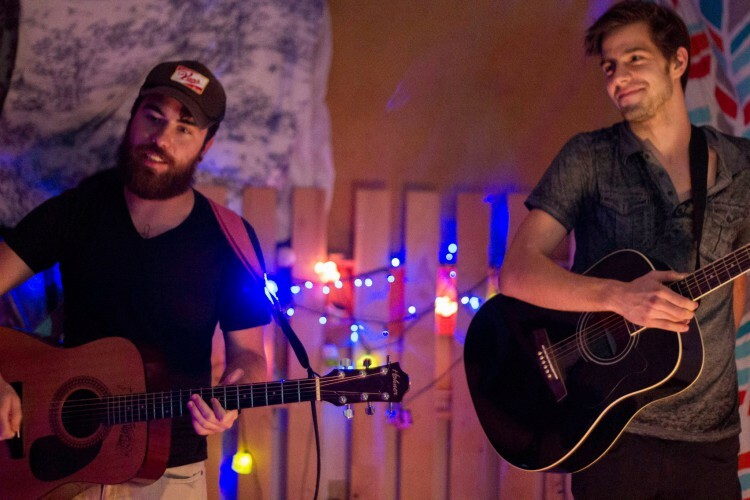 Any Otherwise members Justin Therrell and Kevin Gornichec perform at The Bomb Shelter. Danielle Leonard lives a relatively average life, with one exception: She runs the Bomb Shelter, the largest all-ages D.I.Y venue in all of Savannah. Leonard came to Savannah from her home in Atlanta to attend SCAD, but upon moving out of her dormitory and finding her own place to live, she decided to take on the added responsibility of hosting various shows at her house. Leonard was not one to idly sit by and wait for someone else to fix her problems. In the summer of 2013, she began hosting different musical acts in her backyard on top of her stone bomb shelter, hence the name. The bands and acoustic acts initially trickled in, but eventually gained inertia like a tidal wave. Originally Leonard would host one or two bands a month, but over the summer she had over 40 different acts come through her doors, hosting a show almost once or twice a week. Though Leonard now revels in her accomplishments, she has not forgotten the various hardships she had to overcome. When she originally hosted shows on top of the bomb shelter outside, she dealt with various noise complaints and even threats of being arrested. This was no problem to her. Leonard promptly opened the doors to her house and graciously allowed everyone inside, where she now has musical artists play in her living room. When you arrive to the Bomb Shelter during these next few months, don’t be surprised if you find a fire burning on top of the shelter with a group of people hanging out and enjoying one another’s company. If the weather’s too chilly, go inside and listen to some of the different artists that Leonard has brought in from out of town, or even talk to Leonard herself. She’s always happy to meet new people and make new friends. The Bomb Shelter is located at 637 East 37th Street and rarely, if ever, charges cover fees for their shows. They do strongly recommend donations, all of which goes to the touring bands.